MARIETTA, Ga. - Nov. 29, 2017 - PRLog -- Each year, the Hall County Sheriff's Office (HCSO) fields hundreds of calls from citizens about speeding drivers. For calls like these, HCSO would often deploy their 20-year-old speed trailer. But the aging trailer was no longer dependable to hold a charge, and its bulky size made placement difficult, severely limiting its usefulness. HCSO wanted to replace the trailer with a portable radar speed sign. However, the budget would not accommodate the purchase, and attempts to secure grant funds were unsuccessful. That's when Radarsign stepped in to help. 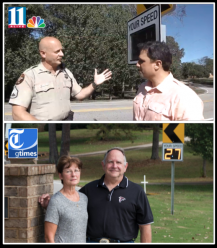 Reporter Nick Watson and photographer David Barnes with The Times (Gainesville, Georgia) and reporter Joe Floccari with Atlanta's 11Alive reported on a how a combination of corporate and private donations allowed the HCSO to get a new radar speed sign and immediately begin making county roadways safer. Marietta-based Radarsign—the manufacturer of the world's first armored radar speed sign—donated a portable TC-400 radar speed sign to the HCSO. The TC-400 was specifically designed to be transported in a standard vehicle and be easily installed by one officer. Sgt. Todd Casper, with the HCSO Traffic Unit, deployed the sign the day it arrived and got positive feedback from residents right away. One couple, Rick and Mary Schumann, had been in contact with Sgt. Casper many times about speeding drivers. Their very curvy street has a 30-mph speed limit and one very sharp curve with a 20-mph speed zone is located in front of their home. "They're coming so fast around the curve, they can't stay in their own lane. They go in the oncoming lane and then over into our yard at a high rate of speed," Rick Schumann said. The Schumanns have lost six mailboxes to out of control vehicles and have witnessed 10 accidents at that location. Sgt. Casper installed the new radar speed sign near the Schumanns' home, and they immediately saw improvement. The Schumann's were so impressed with the sign that they did a little research and found that Radarsign offered an optional traffic data reporting software called StreetSmart (http://www.radarsign.com/traffic-data-reporting/). The Hall County sign did not have the software. The grateful couple decided to donate the funds to purchase the Streetsmart tool for the County. "This is something that we could help the county with... the sheriff's department with because we can't complain if we're not stepping up and doing something ourselves," Rick Schumann said. With the StreetSmart software installed, the HCSO activated the sign in stealth mode to capture baseline driver speeds and peak speeding time. This allows the traffic unit to allocate resources appropriately for enforcement. Sgt. Casper explained to 11Alive reporter Joe Floccari that the purpose of the sign was not about giving out tickets, but saving lives. "Absolutely, that's what we want to do is reduce the number of wrecks, injuries and fatalities in Hall County." After the proven success of the donated Radarsign TC-400, Hall County allocated funds for six more signs. As a result, communities throughout the county will benefit from the safer streets these devices bring about. In 2004, Atlanta-based Radarsign® established new industry standards for traffic-calming solutions with the debut of the world's first armored radar speed signs, which are vandal, weather and bullet-resistant. The industry's most durable radar speed signs are also the most ecological and energy efficient. Engineered and manufactured in the USA, Radarsign products are MUTCD-compliant and utilize recycled aluminum, innovative LED reflector technology, minimal battery power and solar panels to deliver bright, easy-to-read feedback to drivers. Radarsign products are scientifically proven to reduce drivers' speeds and have been entrusted to provide safe and effective traffic-calming solutions for: municipalities, treasured national parks, schools, neighborhoods, military bases, and private and public development projects across the U.S., Canada and overseas. www.Radarsign.com.